24 Port Gigabit Switch, including two combination mini-GBIC ports, that delivers the performance required for high-bandwidth applications. It offers the security and advanced network features needed to support business-class data, voice, security, and wireless solutions. With energysaving technology, the switch optimizes power use to help protect the environment and reduce energy costs without compromising performance. It is easy to configure and manage with intuitive browser-based tools. 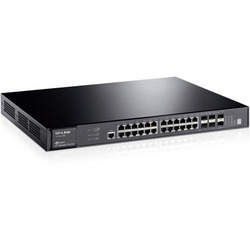 We are offering an excellent quality of which 28 Port Managed Gigabit Switch which is a portfolio of affordable managed switches that provides a reliable foundation for your business network. These switches deliver the features you need to improve the availability of your critical business applications, protect your sensitive information, and optimize your network bandwidth to deliver information and applications more effectively. Easy to set up and use, the 28 Port Managed Gigabit Switch provides the ideal combination of affordability and capabilities for small businesses, and helps you create a more efficient, better-connected workforce. 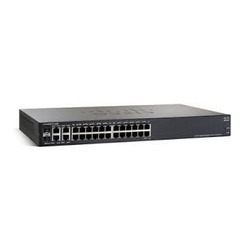 The Cisco SG300-28 switch is an affordable 28 Port Gigabit Managed Switch, including two combination mini-GBIC ports, that delivers the performance required for high-bandwidth applications. It is easy to configure and manage with intuitive browser-based tools and is offered with a limited lifetime warranty, including next business day advance replacement and one year of technical support. The Cisco SG300-28 provides the ideal combination of affordability, performance, and capabilities in a switch designed specifically for small businesses.